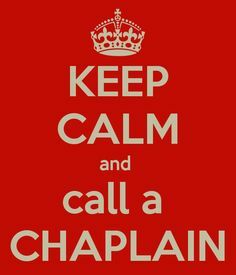 If your sole source for knowledge about chaplains is the British Humanist Society or (especially) the National Secular Society, it is possible that you may have a distorted view of what we do. It may be akin to a Derek Nimmo type figure, spouting irrelevance and intent on conversion; a waste of time and money in other words. The NHS/other state organisation has so little money it shouldn’t waste it on religion etc. I’m open to most points of view,but that kind of argument seems to be close to someone putting their fingers in their ears, going ‘Can’t hear you’ whilst shouting out their point of view untrammelled by actually listening or observing what you are critiquing. From reading other sources, but more importantly working in the field, this seems to be the case of a significant number of people- however they define ‘God’ or ‘spiritual’. This was part of an article that I read in a professional journal. The writer listed the many people that she would see in an average day as a chaplain. I will meet ‘Helga’ today. Many religious people would avoid her or never deal with her. How do you deal with someone who is hostile or abusive towards you? It is far easier to move on and ignore them. But Helga is hurting, Helga is bored, Helga is so frustrated and no one will listen to her. I will. I am paid to, but actually I like listening to Helga. There is something so great about not moving on and listening to someone’s story. Sometimes a quote just hits you, doesn’t it? I thought: this is what I get to do for a living…I am paid not to just look at the cover and assume….but to take time and go beyond that. And I love it: a lot of times I think I have the best job in the world. You still remember years ago in a class where you learned the basics of preaching; someone telling you that the night before it was a good idea to let go. You may have thought that what you had prepared was wonderful: you were on song. You may have thought it was terrible-nothing seemed to connect. Most likely it was something in between; you are trying to witness to God, life, Hope and brokenness- everything is a work in progress. But that person spoke about letting it go: offering what was prepared to God and stepping back….breathing; it was your work, but at the same time it wasn’t. 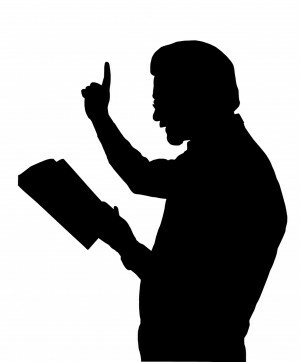 You rarely preach now and are profoundly uncomfortable with the image above (the wise man…always a man….laying down authority from on high: why do so many preachers use a picture of themselves preaching to announce themselves on social media? I digress...): it is more about offering brokenness and hoping The Light breaks in because or despite you. You will always be profoundly uncomfortable when you hear people talk about how well they preached: if you do it properly, how can you boast of your own essential incompleteness? And; after nearly 25 years, you are still nervous…. Author GrahamPosted on August 28, 2016 Categories preachingLeave a comment on Preaching…once more…. I am still listening to a lot of Leonard Cohen and have got stuck on ‘New Skin for the old ceremony’, particularly this song. This track is so different from the album version (and you can find another version : ‘no 2’ on youtube) and it showcases Cohen as I like him: louche, doleful, thoughtful, humorous and ‘spiritual’. The song begins at around 2:30. At the elite level, teams are selected by a group of people. Lengthy analysis is available for each player and they and those on the fringe are tracked all season as to their progress. The best available players are selected. At village 2nd XI level, the process is subtly different. Selection begins in the week before when the captain (who received the appointment initially as a great honour before reality set in) sends a text around: ‘Great Snitterton this Saturday: are you available?’ From this list, he selects the most able players, or at least he would do; however this initial sweep usually attracts 3 players. Gradually the texts become more desperate: ‘Please, please can you play- I know you have two broken legs and your arms no longer work, but we are desperate’. Eventually enough people cave in to get around 8-10 players. The team I play for has an added edge: the young captain goes out on Fridays and gets very drunk- he asks his friends (also very drunk) to play. They crash at his parent’s house, sleep it off and are reminded in the morning as to what they agreed. I am sure that England don’t follow this method, but it has been very effective in getting a full XI and supplementing the usual crowd of the young, the halt and the lame. Sometimes this approach to team selection is very effective, more often it is not: you lose more often than you win. However, whilst you don’t mess about and you really try to win, you do end up having a lot of fun and thinking ‘what a great way to spend a Saturday’. In June I did a series of 5 posts on village cricket. This is the 8th post in another series of 5. Years ago, I once took my whole family to a 20/20 at Chester le Street. My wife rarely goes to watch cricket, especially cricket featuring first class teams. She looked around the food concessions that served every variety of cholesterol known to man and remarked ‘It is not very healthy is it? I thought there would be healthy food here’…. 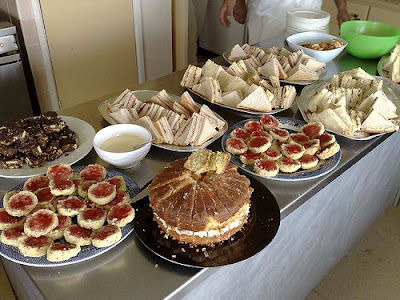 …and after that I discovered cricket teas. They have a noble heritage; in some villages they were prepared by a rota of village residents & by all accounts (around the time when old maids cycled to matins at the parish church, the sun never set on the British Empire and Geoffrey Boycott ran out his first batting partner) they were fantastic affairs full of home baking etc. In some villages, much of the village would come to the tea. Some of the village would even spectate (when my children were much younger, I used to take them to watch village cricket, but this was only so I could persuade someone to open the bar. In my head, as I had children with me, that still counted as childminding). Even then, I guess that they did not count as ‘healthy eating’, judging by the girth of many seasoned village cricketers. Now as those days recede, there are still some wonderful teas, but most seem to consist of chocolate doughnuts, copious amounts of tea and egg sandwiches. I have never understood the rationale for egg sandwiches: why would anyone want to eat something that looks like (and on a bad day tastes like) vomit? However, they are truly a wonderful invention. I get strangely excited as the 2nd XI I occasionally play for blazes away to 68 all out off 38 overs and the prospect of culinary excellence approaches. It usually takes away the sting of an abject personal failure with the bat; it always means that I have to plan a long run the next day merely to keep my figure remaining svelte…. In June I did a series of 5 posts on village cricket. This is the 7th post in another series of 5. 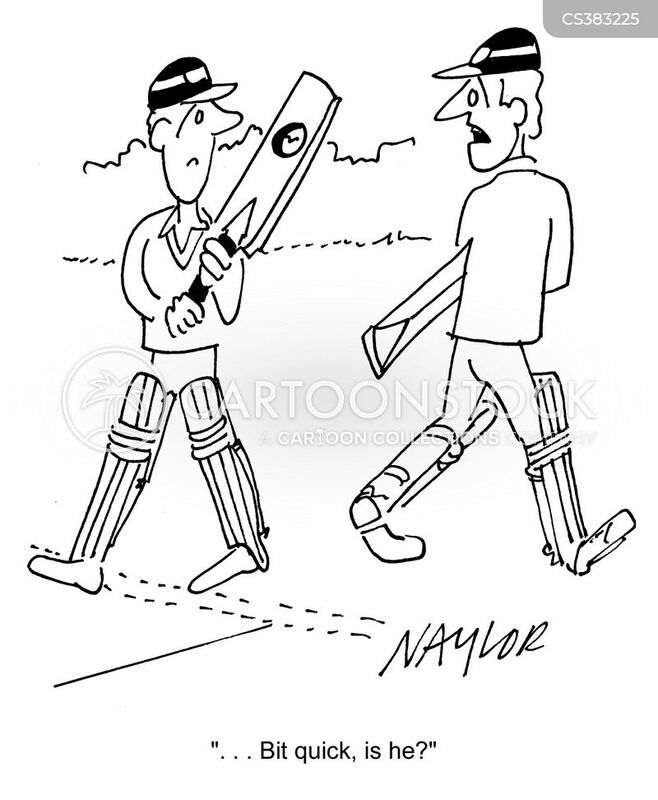 When you play village cricket, you dread the arrival of a ‘ringer’ on the opposite team. This is someone who can actually play, play very well and is somehow getting a game with the opposition. The bowling ringer is comparatively rare- if they turn up, they are easy to spot: thin faced, gimlet eyed and generally mirthless. They are invariably fast, very scary and inclined to be even more mirthless if-as often happens- the opposing batsmen proceeds to flash at every ball and get streaky fours through the wicketkeeper’s and slips’ hands. The batting one is more common. They might say ‘I don’t play very often now’, before opening a bag that has more than one bat in. When faced with a choice, they will address whoever is listening with words like ‘this one still has a few runs in it’. By this stage, the opposition already have an idea on what is going to happen….. He will generally come in at 3 or 4; trusting the openers to get a few and wear down the better bowlers. When it is his turn, he pauses slightly before leaving the pavilion, saunters out, often whirring his bat (no one at village cricket does that, unless they are too young or trying to pose. 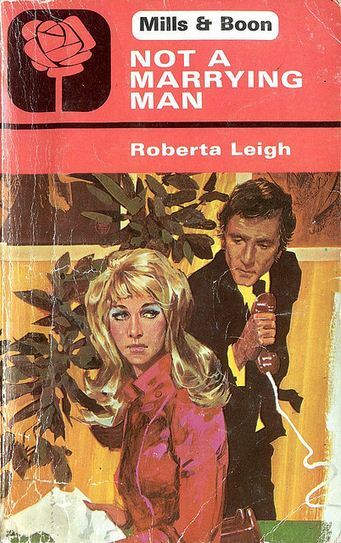 Actually, no one poses at the level I play at), and adjusts his trousers/box. He is usually overweight, but his arms are as think as treetrunks. At this point, the fielding side visibly tremble. The first ball comes down and no one sees it until it hits a car in the car park. After that, there are a succession of 4s and 6s and an occasional exaggerated forward defensive. No one wants to bowl and shoulders droop. A mood of resignation settles upon the fielding team and even the team wag is silent. Eventually he will get too cocky and will top edge an outrageous shot and get caught. The traditional clapping is muted: there is hatred in the fielding team’s hearts. No one will talk to him over tea and we aren’t too keen on the fielding side either: we now rate them as ‘too serious’. Next year it will be hard to get people to play against them. It is not the done thing to pick a ringer. Unless, of course, he plays for you…. In June I did a series of 5 posts on village cricket. This is the 6th post in another series of 5.